If you're dealing with stomach troubles, such as gas, constipation, it can be difficult to figure out what exactly is wrong inside your body. There are many common digestive disorders, and many have similar symptoms, some of them are related to serious health issues. 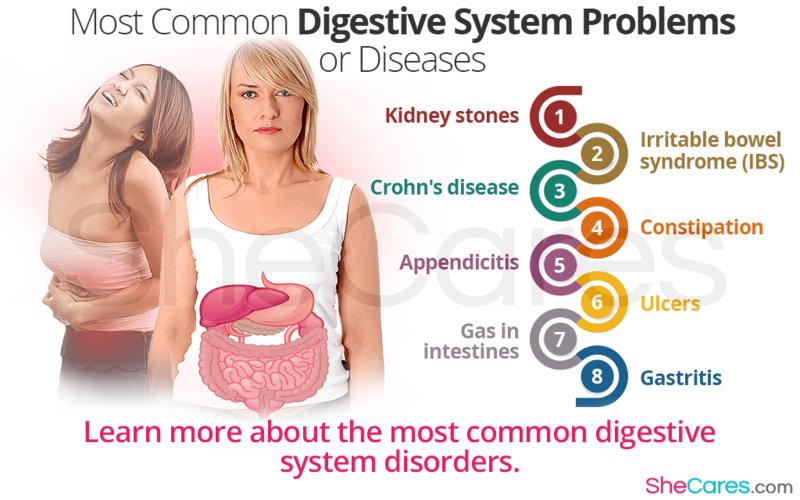 To learn more about the most common digestive system disorders, keep reading. Small deposits of crystallized minerals can form in the kidneys, which can cause significant pain. They are not normally dangerous and can usually be passed naturally, but they often cause severe pain, especially pain that hits both the stomach as well as the back and sides. Some kidney stones, especially stones that are blocking the flow of urine, may require surgery. A common digestive disorder, IBS is a problem with the large intestine that causes inflammation and irritation in the digestive tract. It most often results in symptoms such as pain, bloating, gas, diarrhea, constipation, or other changes in bowel movements. IBS has no cure, but can be treated with dietary changes and a doctor's help. An autoimmune disorder, Crohn's disease causes widespread inflammation in the digestive tract. The symptoms of Crohn's disease can be debilitating, and may not even resemble symptoms of a digestive disorder. It can cause abdominal pain, diarrhea, and weight loss, as well as fever and fatigue. There is no cure, but there are treatments available. Another extremely common symptom of stomachaches, constipation occurs when stool cannot be passed through the digestive system quickly enough. It is often caused by a poor diet, and can be ameliorated by eating enough fiber. It can be painful enough to send people to the hospital, and usually causes bloating as well. The appendix is a small pouch on the colon that has no purpose, but sometimes gets inflamed or infected. When this happens, there tends to be severe pain in the right lower abdomen. An infected appendix must be removed surgically as soon as possible, so you should seek emergency medical assistance. These are small sores that form on the stomach lining due to an issue with the mucus lining the stomach. They are caused by a bacteria called Heliobacter pylori, and they can be extremely painful. The symptoms of ulcers are most commonly severe pain, especially when eating. While it may sound like nothing, having extra gas in the intestines can be surprisingly painful. It is the most common cause of stomachaches, and is not dangerous, but can cause abdominal pain ranging from mild to very strong. Like ulcers, gastritis is due to the bacteria Heliobacter pylori. However, gastritis is an inflammation of the stomach lining and does not necessarily come along with ulcers, although the two are often linked. Knowing more about these common digestive problems can help you learn more about which illness might be plaguing you. To learn more about irritable bowel syndrome, read irritable bowel syndrome FAQs article.